Heavy Makeup at the Beach - A Summer Faux Pas? I was recently asked by Swimwear365 to take part in a little feature they're doing on 'Summer Faux Pas'. After perusing the list of possible 'faux pas' they gave me (including things like dodgy tan lines, panda eyes and socks and sandals) I couldn't resist taking part when I spied 'Heavy makeup on the beach' on the list. I love makeup. You all know that, right? And I love looking after my skin. I also love holidays, but I like feeling confident on holiday even more. When it comes to wearing makeup beachside, I have tried both ends of the scale - I've gone completely barefaced, all-out heavy makeup and I've met somewhere in the middle. Of all those three, the one I felt most comfortable with? 'Heavy' makeup, of course. I like looking like I'm wearing makeup and I don't feel like 'me' without it. Even when I pop a little bit on and keep things simple, I still find myself feeling a bit self-conscious and not altogether myself. I know it's bad to say I rely on makeup to keep me feeling confident, but the fact of the matter is I enjoy wearing makeup, and if you'd rather look glam on the beach than spotty, pale and tired, then why not embrace heavier makeup at the beach? I'm not saying everyone should, I'm just saying for me, I feel a lot happier with a full face of slap. Unfortunately I'm not blessed with clear, bright skin, nor am I blessed with long eyelashes and zero pores. If I was, I don't doubt I'd be rocking the barefaced look at the beach, but whilst my skin is the way it is, I think I'll stick with going a little heavier on the makeup than most. First of all, I think the key factor in making your makeup look and feel good on the beach, is making sure you prep your skin right. By that I mean, doing some face masks and pamper sessions a few days/weeks before your holiday, to make sure your skin is ship-shape for the sun. 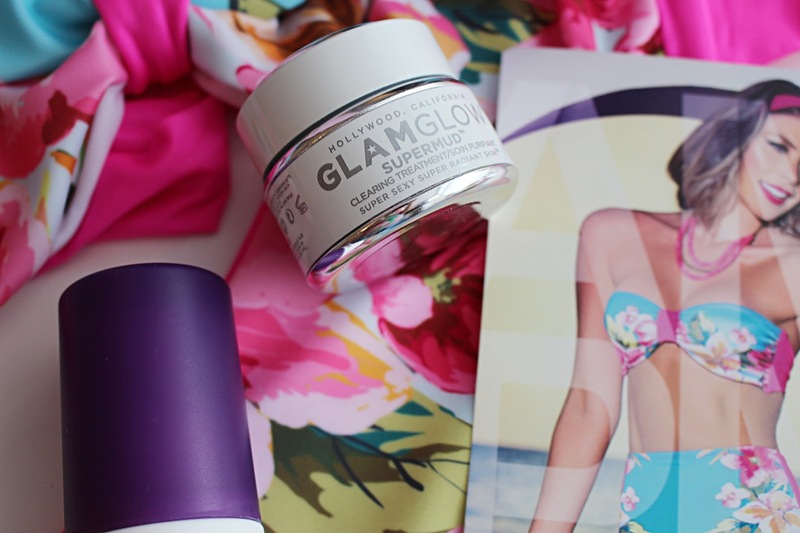 I'm completely obsessed with GlamGlow's SuperMud Mask*, which is perfect for blemish-prone skin like mine. I like to use this a couple of times a week a few weeks before going on holiday, as the more you use it, the less visible your pores (and spots!) appear. If I know my skin is pretty clear prior to jet-setting off somewhere, I know I'll immediately feel better about myself and my makeup will sit all the nicer on my skin. Another way I like to prep my skin is by using a gradual tanning moisturiser on my face. My favourite has got to be Olay's Complete Care Day in Dark*. This gives me a lovely glow as the days go on, feels really nice on my skin and contains SPF 15. What more could you want!? Then of course, it's on to the makeup. My thoughts on beach foundation are thus - either go for a high-coverage BB cream or just opt for a high coverage, long-lasting foundation. There is NO point wearing foundation if you know it's just going to melt off your face, so go for one that lasts. My choice? 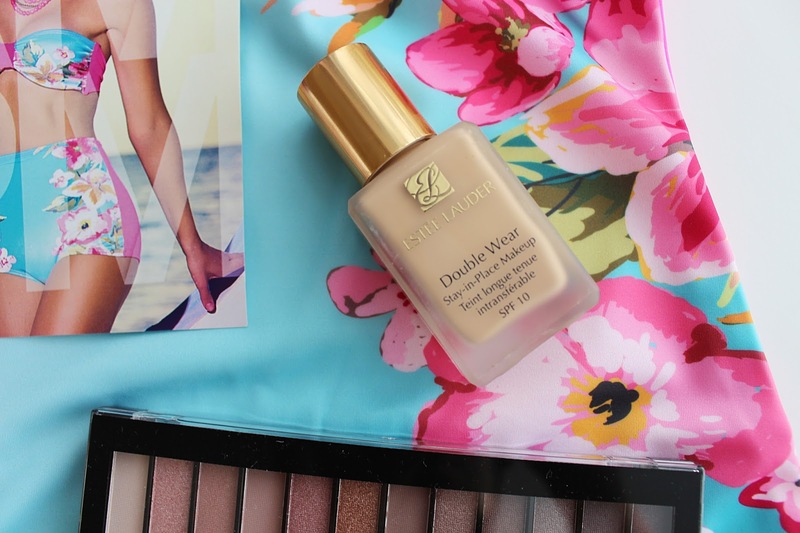 Estee Lauder Double Wear*, of course. Long-lasting, matte, high-coverage and conceals everything I need it to. It's ideal for wearing beachside because it always stays put. To give it a little extra oompth however, I think it's best to either prime beforehand or opt for a setting spray once applied. I love Urban Decay's Up All Night Setting Spray* as it really keeps my foundation in place, and it always gives a nice cool refreshing spritz when applied. For eyes, I think you can probably get away with going sans shadow, but where's the fun in that? I vote for taking a palette like the Makeup Revolution Iconic 3 Palette* on holiday, as it has all the shadow and highlighting shades you need, for day and night. In terms of lashes, you could always go for a waterproof mascara, but to be honest whenever I go away I always treat myself to some lash extensions beforehand. They give you gorgeous, long fluttery lashes throughout the entirety of your holiday, with no makeup needed. I always get loads of compliments if I have extensions on when I'm away. Finally, if you're not fond of lippy for by the beach (and to be honest I'm not really keen - especially when the weather is so hot your lippy ends up melting by the end of the day!) it's always best to go for a lipgloss. 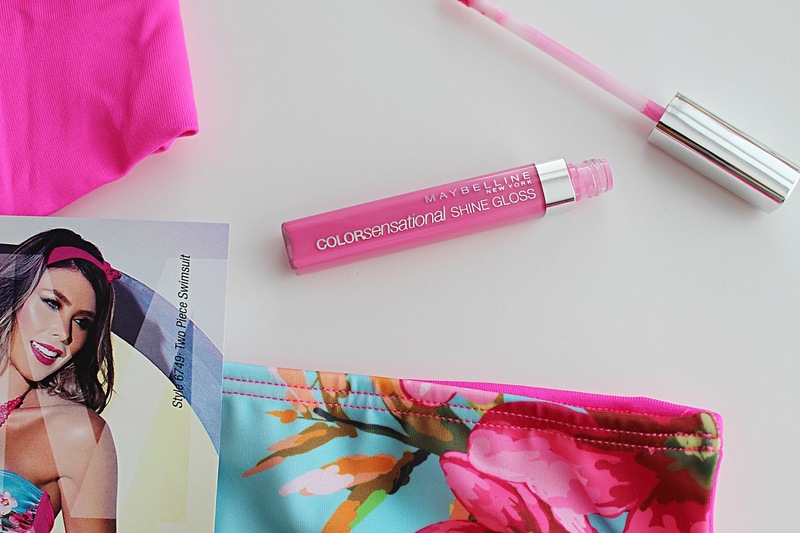 I usually hate lipgloss but I am head-over-heels in love with the Maybelline Colorsensational Shine Gloss* in the shade Pink Shock - whereas most lipglosses hardly give any pigmentation this is super pigmented and also super pink - perfect! And there you go - doesn't look overly done or too heavy, does it? I think the fact I opted for no blush or bronzer and stuck with extensions for my lashes with no liner makes the whole look a lot more beach-wearable. Okay, people are probably still going to think you look a little too dolled up to be frolicking in the sea - but honestly, when you're on holiday, who cares? If you look and feel great that's all that matters. I honestly love this look and would definitely wear it pool-or-beach-side if I was lucky enough to be going away! So, once your makeup is done, all that's left to do is whack on your favourite bikini and soak up the sun. I was lucky enough to be sent the gorgeous AM:PM Floral Retro Pin-Up Girl Bikini* from Swimwear365 and it is most definitely my dream bikini. The perfect colour palette, high-waisted and floral?! I feel like it was made for me. What are your thoughts on heavy makeup at the beach being a summer faux pas? 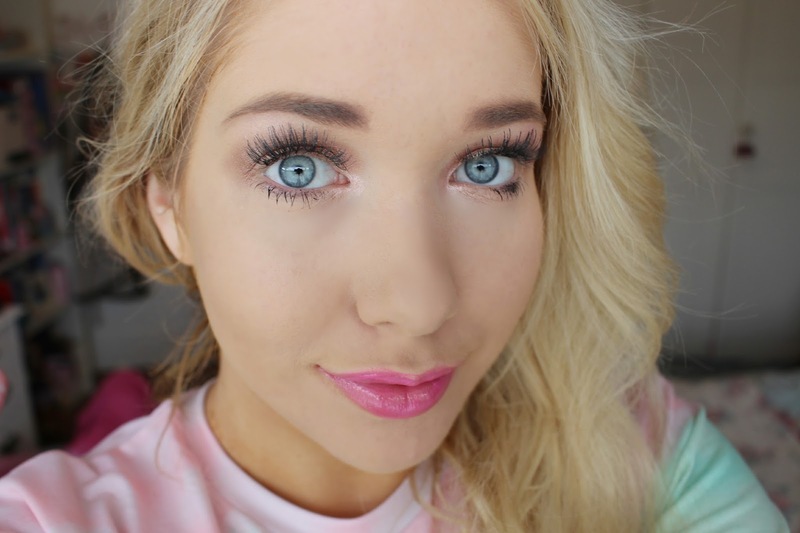 Do you agree, or do you think I've shown you can still make 'heavy' makeup look beach-worthy?